This bird’s-eye view of Highland Park Village is from an ad placed in the Highland Park High School yearbook by Flippen-Prather, who really wanted to stress how there was NO PARKING PROBLEM at this convenient “North Dallas” location, above ground and below ground. Don’t worry, Flippen-Prather had you covered. Fifty years on from this ad, Highland Park Village is physically still recognizable, just expanded. The tenants, however, are now much more chi-chi. I’m not sure when the top photo was taken, but it appeared in the 1966 Highland Park High School yearbook. Here are the tenants of Highland Park Village in 1966 (click to see a larger image). 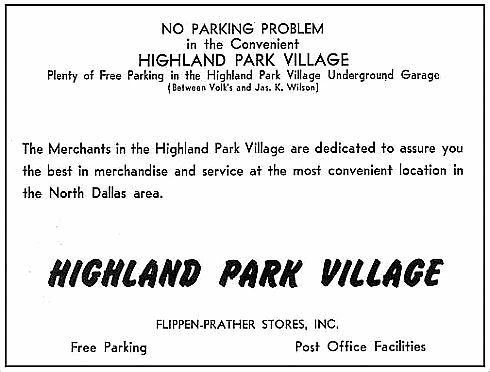 Ad for Highland Park Village/Flippen-Prather Stores, Inc. appeared in the 1966 Highland Park High School yearbook. 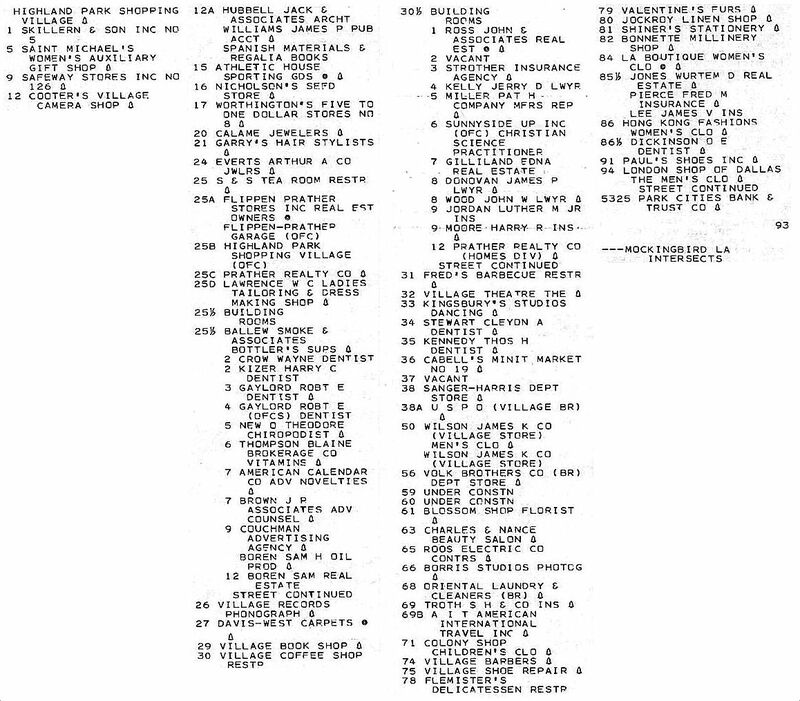 Listing of Highland Park Village businesses is from Polk’s Greater Dallas City Directory, 1966. All images larger when clicked. Looking at the 1952, https://www.historicaerials.com/location/32.83585880896729/-96.80571913719176/1952/18 1958, https://www.historicaerials.com/location/32.83585880896729/-96.80571913719176/1958/18 and 1968, https://www.historicaerials.com/location/32.83585880896729/-96.80571913719176/1968/18 aerials shows some obvious differences. The building in the right center of the bird’s eye was split by a road in 1952. The vacant lots in lower right of the bird’s eye were cleared in 1958 and a parking lot was there by 1968. I am not sure that proves the bird’s eye was taken before 1958 and after 1952 but the cars I can see look to be from the 1950s so I think it is likely the bird’s eye was taken in the mid 1950s. Yeah, looks like the ’50s to me. I guess if you’ve got an impressive photo you probably paid a lot to have made, you use it over and over in your advertising. 2017’s HPV needs a seed store. Does anyone know what happened to the underground parking garage referenced in the ad? I don’t believe it’s there today.